Updated the script and the extractor. Characters followed by ﾞ or ﾟ are remplaced by their all-in-1 counterpart. [error] invalid image dimensions (2040, 2040). It basically scan the rom from the file offset 0x2200 until it fails to decode an image. The images are output in ASCII RGB PPM format. Gimp can read them. It only uses one hardcoded palette. 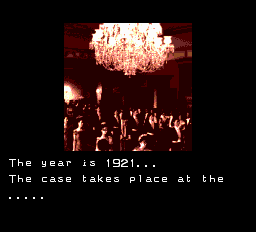 I plan to add 8bpp PCX output in the future in order to output each image with the palette extracted from the rom. The images are now output as 256 colors PCX files containing 2 palettes. The first one contains the original palette scaled to [0,255]. The second one contains the original values (r,g abd b between 0 and 7). I think I found the tables. The good thing is that it as the following format: bank offset. So basically the ROM can be expanded if needed. So basically I won't have to modify the text routine. I'm hunting down menus. So far I've found the main one and the "interrogation" sub menu. The current extraction code needs to be modified to handle them. Here's a quick menu test. 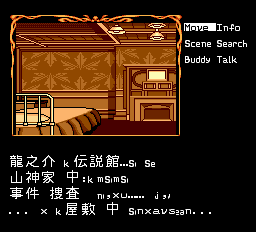 Unfortunately due to space constraints, I had to choose a less "formal" translation for some items. For example "Partner" becomes "Buddy". "Crime scene" is now "Scene". And "Interrogate" is now "Talk". I'm not super happy with it. I'll try to hack the menu display routine to have one item per line. Choose between Backup RAM or password. The BRAM doesn't seem initialized. The Backup RAM is full! Do you want to delete some files? Please select a file to delete. Please choose a BRAM file to save. Please choose a BRAM file to load.